“The Rumble in the Jungle” took place on Oct. 30, 1974, in Kinshasa, Zaire, now known as the Democratic Republic of the Congo. It was one of promoter Don King’s first major fights. He persuaded Ali and Foreman to fight each other — he had them sign separate, blank contracts — as long as he could get them $5 million each. Zaire’s president, Mobutu Sese Seko, guaranteed the money so long as the fight took place in his country. 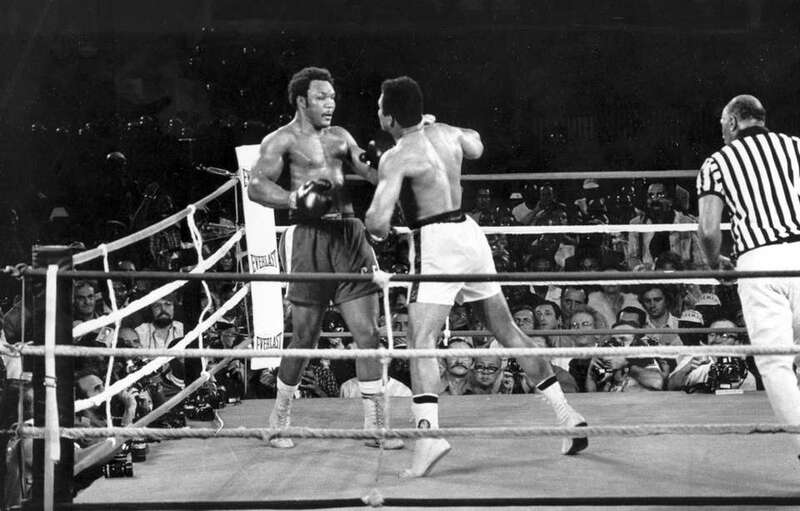 Foreman had knocked out Joe Frazier in 1973 to claim the heavyweight title. 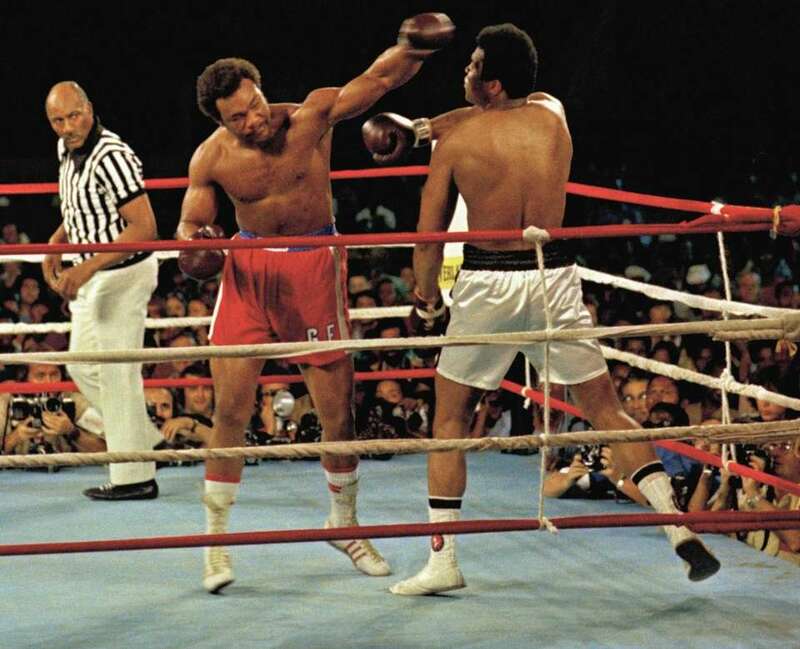 At the time he fought Ali, Foreman was 25 years old with a 40-0 record (37 knockouts). 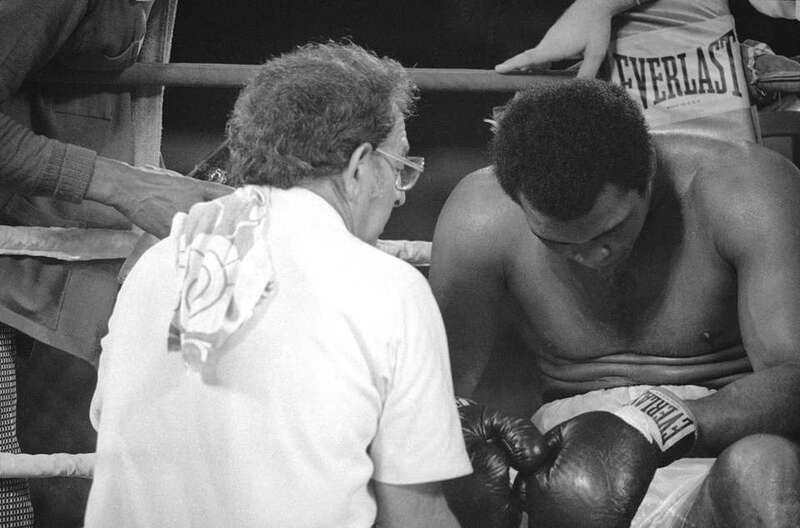 Ali, the 32-year-old former champion, was a prohibitive underdog. 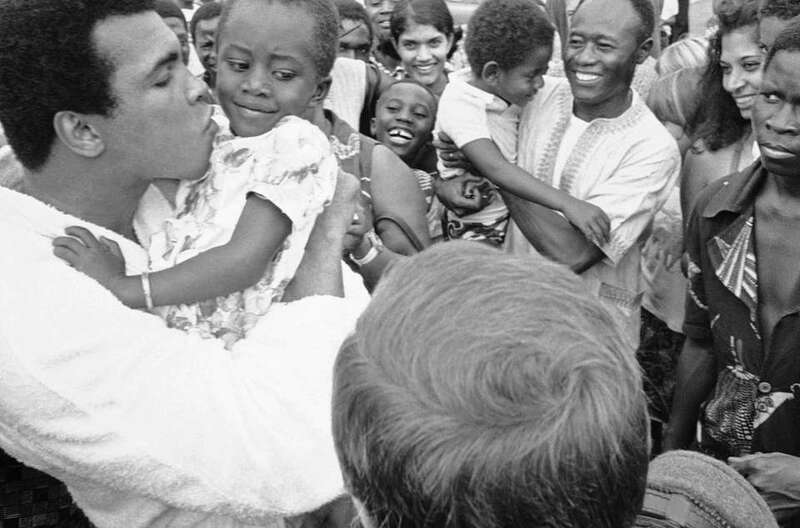 Muhammad Ali plants a kiss on cheek of ayoung girl at his N'Sele training camp in Zaire, on Oct. 26, 1974. 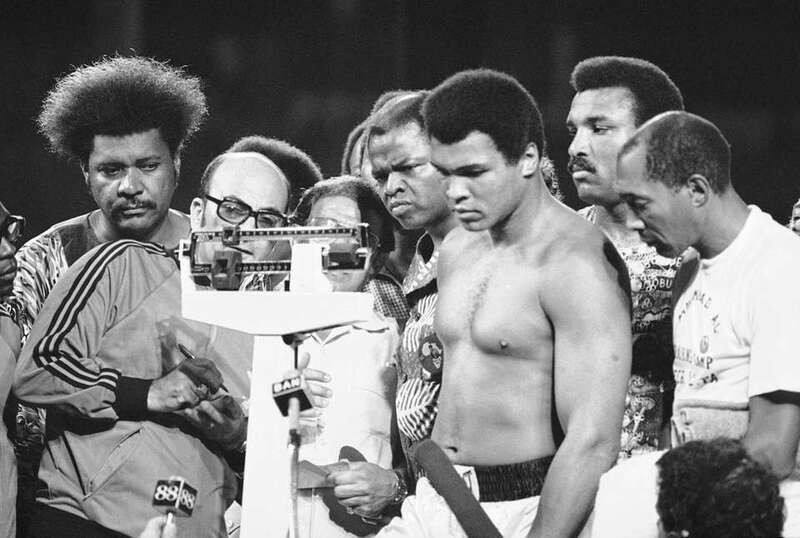 Muhammad Ali and an official read scales during weighing on Saturday, Oct. 26, 1974 at stadium in Kinshasa, Zaire, for his fight against heavyweight champion George Foreman in Kinshasa on October 30. 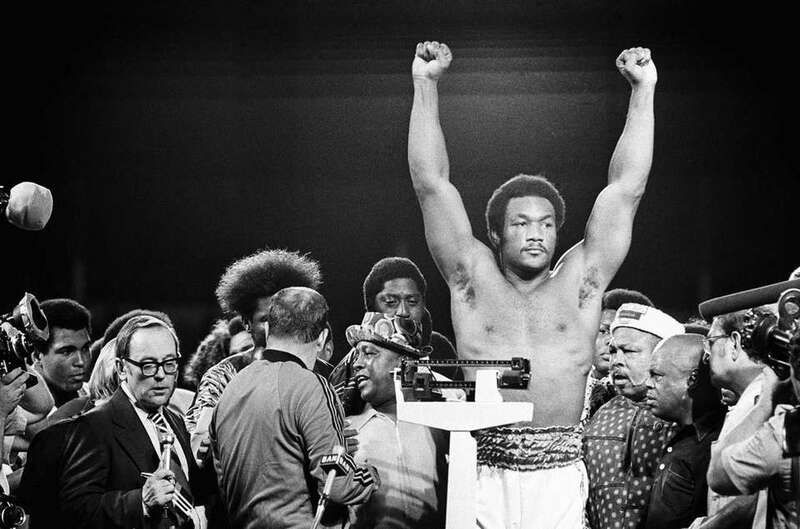 Heavyweight champion George Foreman responds to cheers of crowd in stadium in Kinshasa, Zaire Saturday night, October 26, 1974 during weighin for his title defense against Muhammad Ali. 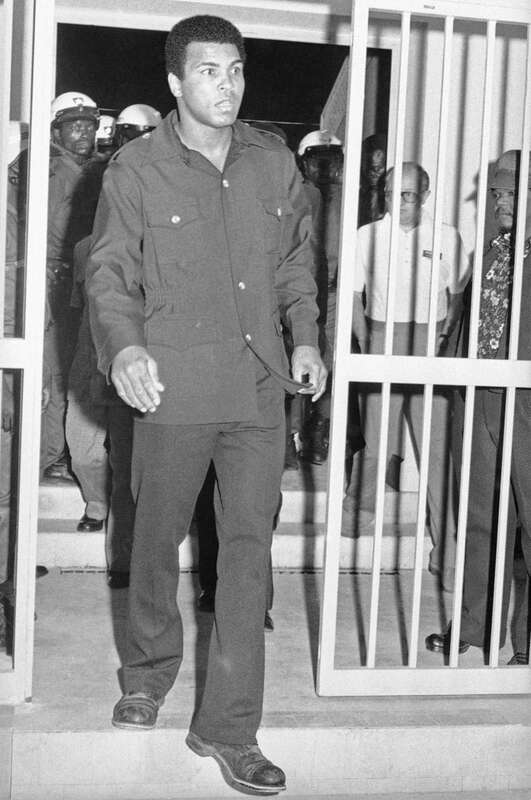 Muhammad Ali arrives at the stadium in Kinshasa, Zaire, for his bout with heavyweight champion George Foreman on Oct. 30, 1974. 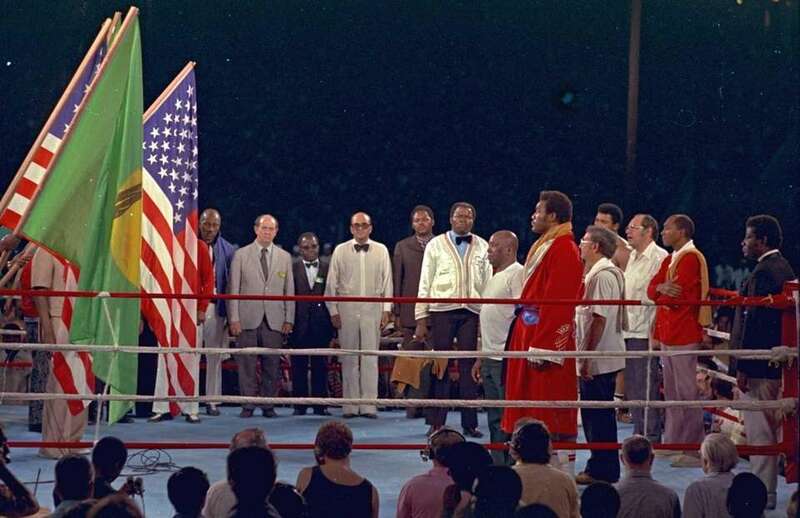 The opening ceremony of the national anthem is shown in Kinshasa Stadium, Zaire, Africa, October 30, 1974, prior to the world heavyweight championship bout between George Foreman and challenger Muhammad Ali. 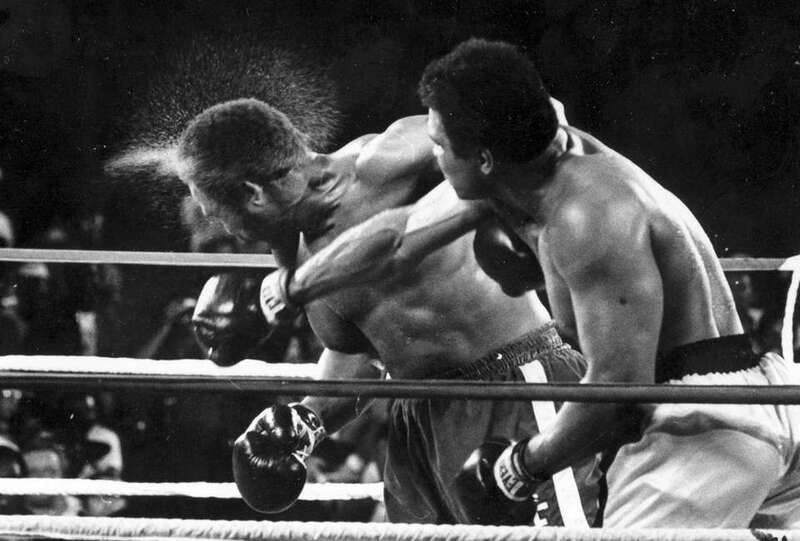 Muhammad Ali, right, deflects a punch by George Foreman, in Kinshasa, Zaire, on Oct. 30, 1974. Champion George Foreman is shown covering up from Muhammad Ali's stinging left jab in the early rounds of their heavyweight title fight in Kinshasa, Zaire, Africa, October 30, 1974. 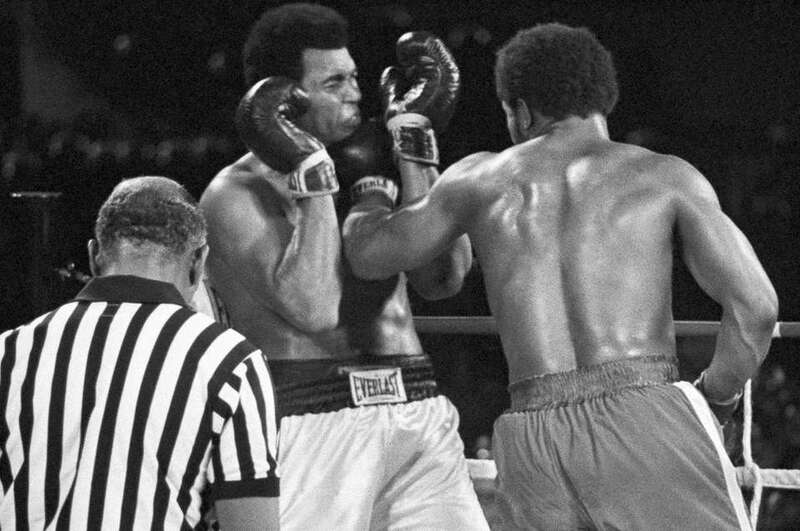 Ali regained his title with an eighth-round knockout. 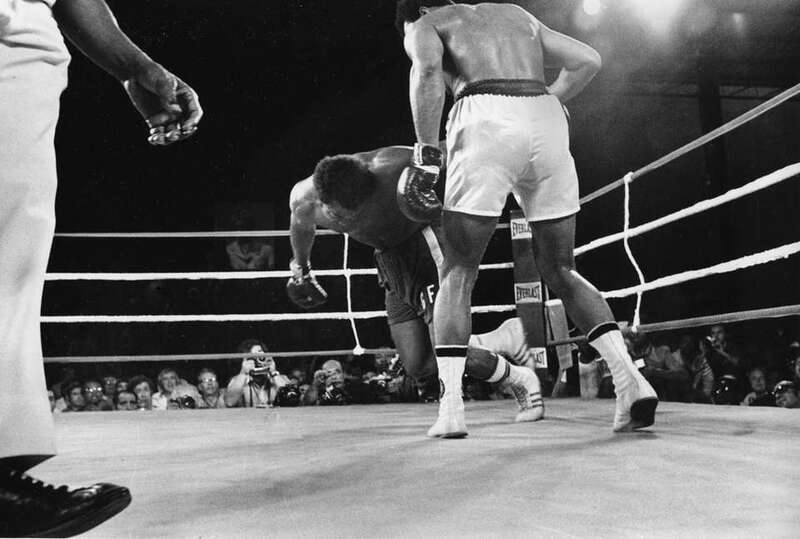 George Foreman, center, lands a body punch to Muhammad Ali during fight action in Zaire, Africa, Oct. 30, 1974. Muhammad Ali talks to his cornermen during his bout with George Foreman for the heavyweight crown in Kinshasa, Zaire on Oct. 30, 1974. Sweat flies from the head of George Foreman as he takes a right from challenger Muhammad Ali in the seventh round in the match dubbed the "Rumble in the Jungle" in Kinshasa, Zaire, on Oct. 30, 1974. Muhammad Ali winces as he takes a George Foreman left to the jaw in fifth round of their heavyweight championship bout in Kinshasa, Zaire, on Oct. 30, 1974. 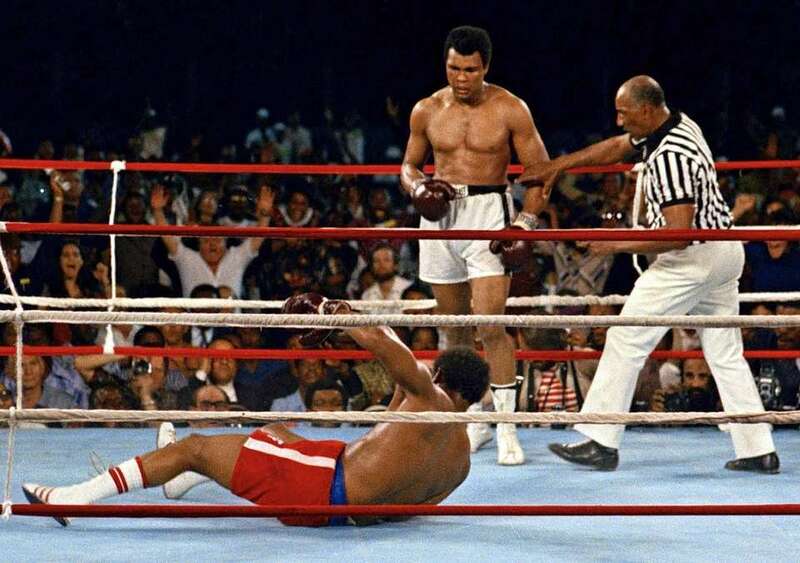 Ali knocked out Foreman in the eighth round to regain the title. Muhammad Ali talks to his cornermen during his bout with George Foreman for the heavyweight crown in Kinshasa, Zaire, on Oct. 30, 1974. Defending world heavyweight champion George Foreman, left, watches a right from challenger Muhammad Ali that ended their title bout in the eighth round at Kinshasa, Zaire, Oct. 30, 1974. 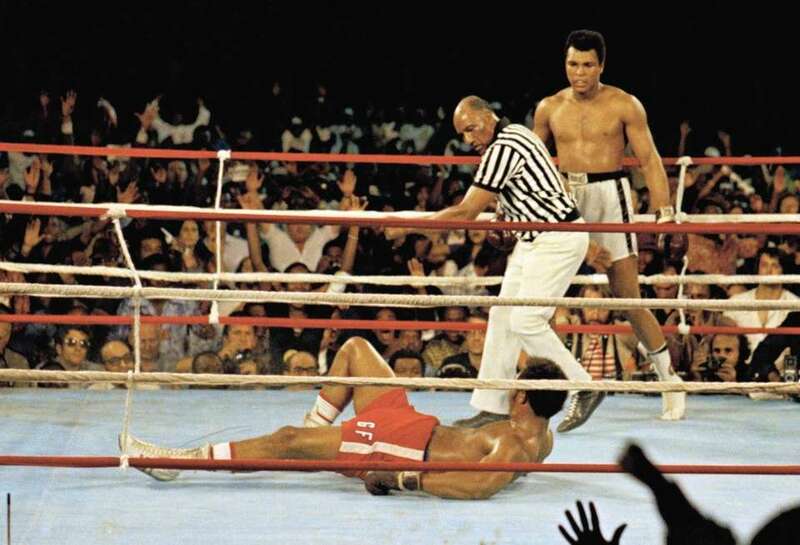 Foreman fell to the canvas and was counted out by referee Zack Clayton, right, in the "Rumble in the Jungle." 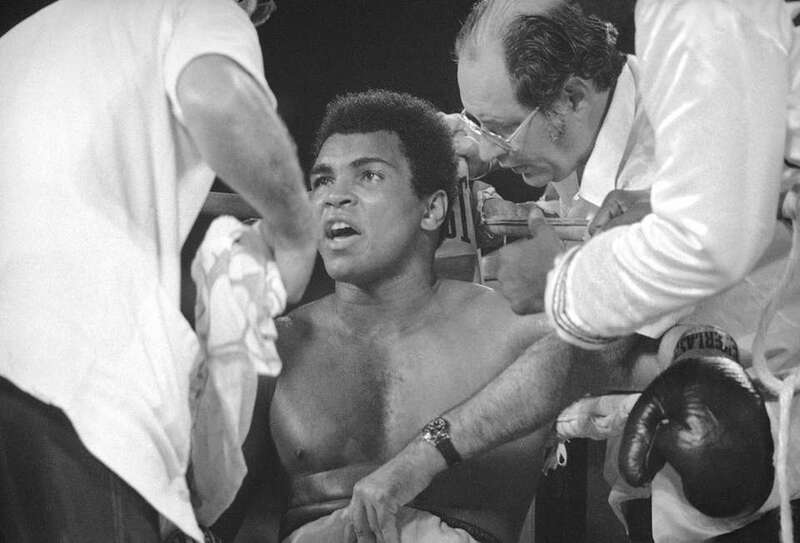 Muhammad Ali as he watches George Foreman head for the canvas after being knocked out in the eighth round of their match in Kinshasa, Zaire, on Oct. 30, 1974. 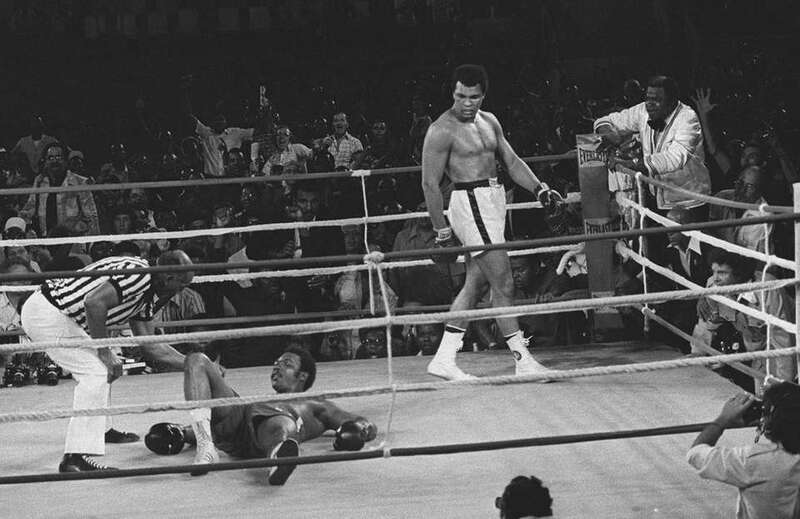 Challenger Muhammad Ali watches as defending world champion George Foreman goes down to the canvas in the eighth round of their WBA/WBC championship match in Kinshasa, Zaire, on October 30, 1974. 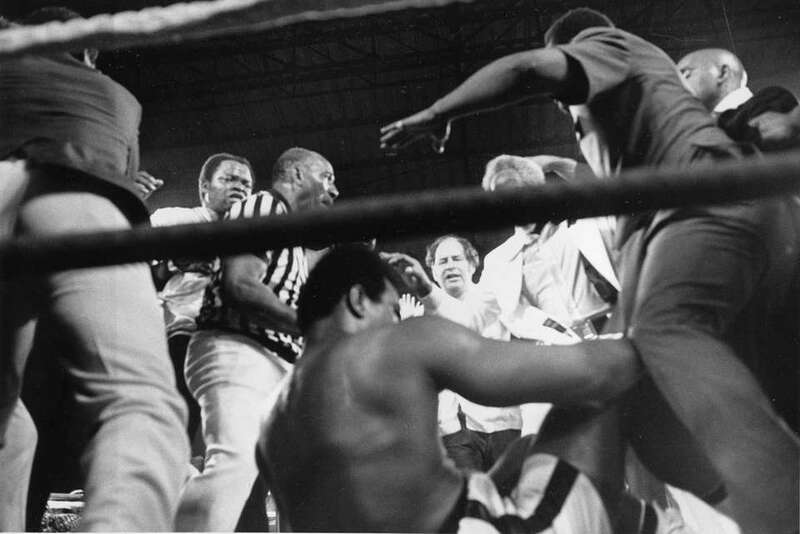 Referee Zack Clayton, right, steps in after challenger Muhammad Ali looks on after knocking down defending heavyweight champion George Foreman in the eighth round of their championship bout in Kinshasa, Zaire, in the "Rumble in the Jungle" on Oct. 30, 1974. 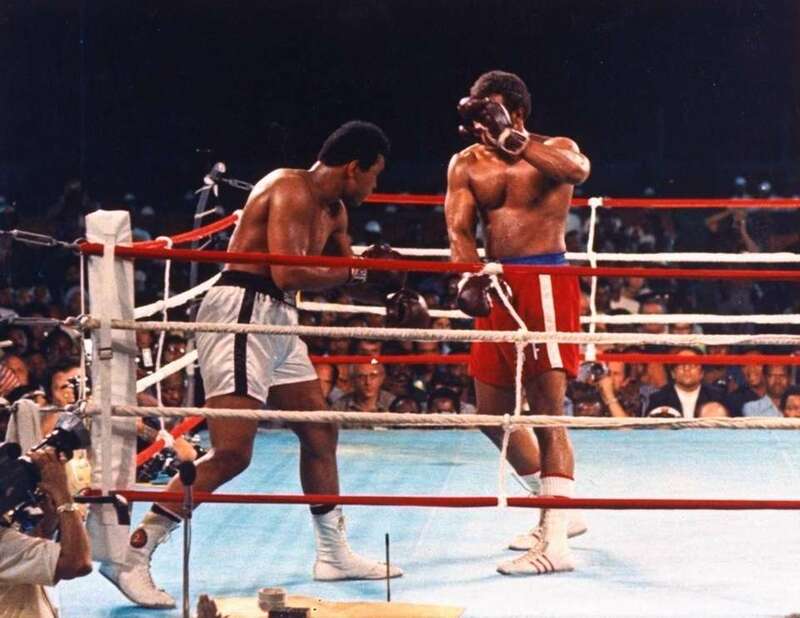 Ali regained the world heavyweight crown by knockout in the eighth round. 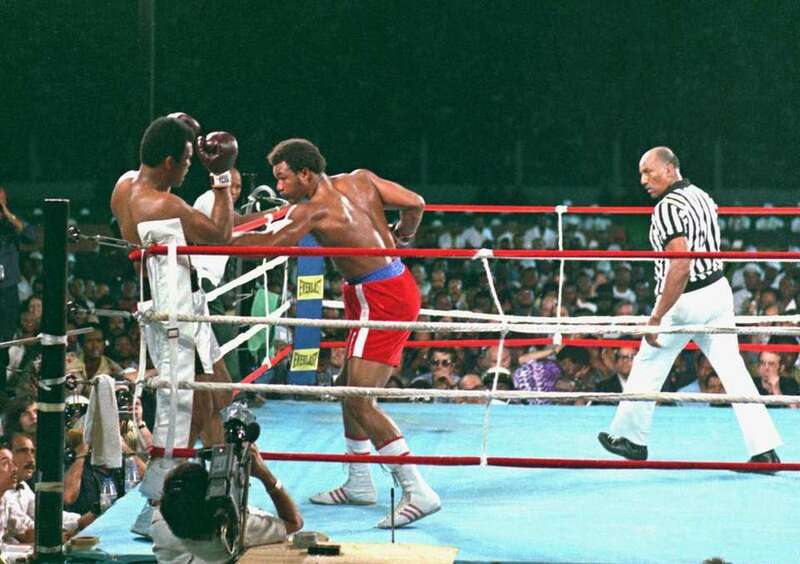 Muhammad Ali, right, stands back as referee Zack Clayton calls the count over opponent George Foreman in Kinshasa, Zaire, on Oct. 30, 1974. 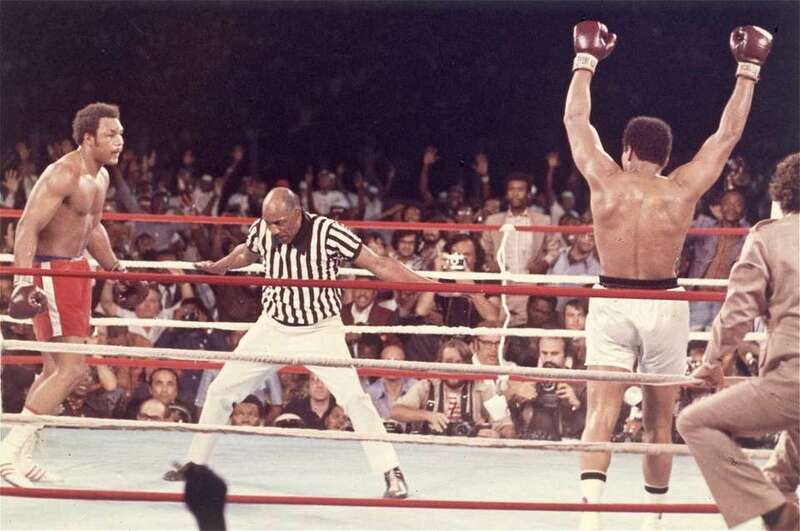 Referee Zack Clayton counts out George Foreman in eight round of this title bout with Muhammad Ali, in Kinshasa, Zaire. Oct. 30, 1974. Muhammad Ali, arms raised in victory, walks to his corner as referee Zack Clayton counts out George Foreman after Ali knocked him down in the eighth round of their title bout in Kinshasa, Zaire, October 30, 1974. An exhausted Muhammad Ali falls to the canvas after knocking out defending champion George Forman and regaining the world heavyweight title in Kinshasa, Zaire, Oct. 30, 1974. 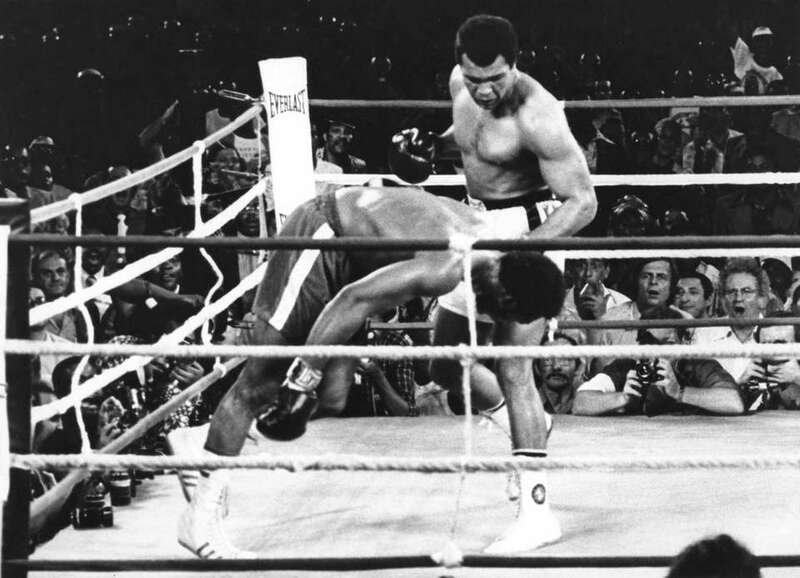 Ali knocked out Foreman in the eighth to regain the world heavyweight title. Former heavyweight champion George Foreman peers from under a studded denim hat as he made an appearance in the lobby of his Kinshasa Hotel, Thursday night, October 31, 1974. 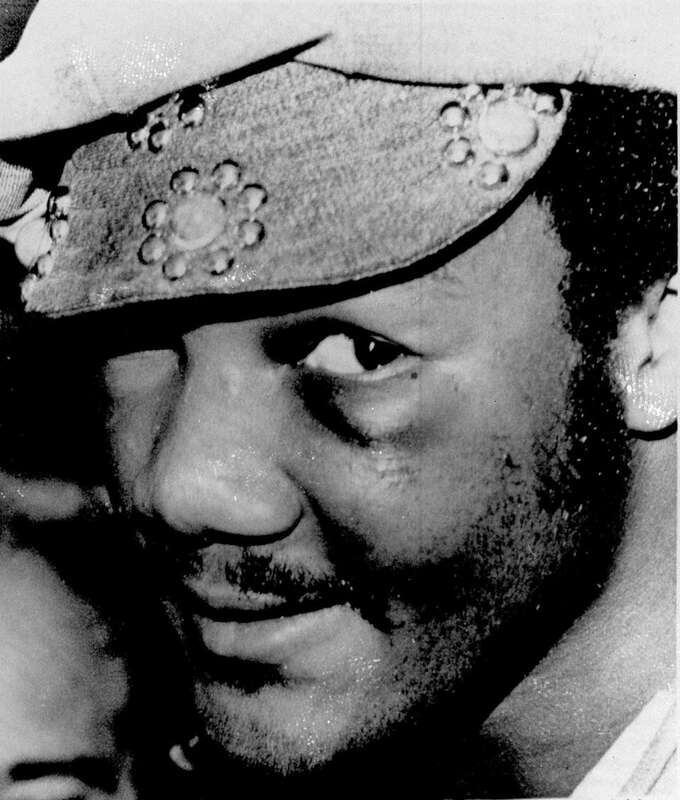 Foreman displayed signs of his bout with Muhammad Ali -- a swelling under the left eye -- as he signed autographs and talked with admirers.